Official Google India Blog: The results are in for the Google ‘Get Social?’ Marketing Challenge! The results are in for the Google ‘Get Social?’ Marketing Challenge! Google ‘Get Social?’ Marketing Challenge - that was designed to give students a real-world flavor of how to build, nurture and leverage social communities to transform the way campuses interact internally & externally. Teams from 37 premier campuses weaved the social web & its tools into the everyday fabric of campus life. In a matter of few weeks online communities for existing students, alumni and faculty were established serving uses as varied as - digital notice boards, instant alerts on schedules and even forums for exchanging class notes! 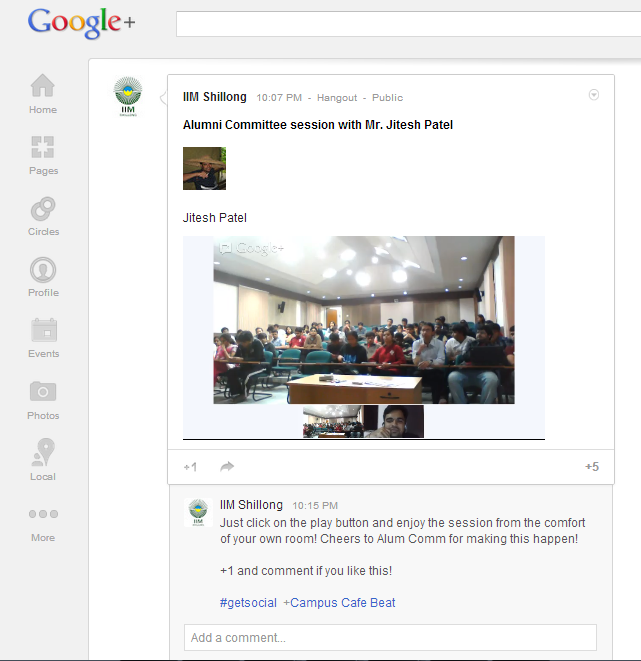 IIT Patna used Google Drive’s doc sharing with Google+ Circle’s to set up a common folder where 800 notes got uploaded in under 72-hrs! IIM Shillong ensured that group studies continued across hostel buildings even when it was pouring outside and alumni speakers who couldn't squeeze the long flight into their work schedules still met with the students through a widespread use of Google+ Hangouts. IIT Guwahati went a step ahead and launched their own Internet TV channel – ‘GTV’ by partnering with the RadioG team and livestreaming their campus radio channel onto a YouTube. IIT Patna – used Google Maps and Google+ to crowdsource a map marked with all the eating addas around campus with detailed information on what to eat and even the most convenient ATMs in case students run out of money. This was a boon for fresher’s and seniors alike! IIM Indore decided to make their quiz festival virtual and conducted a 20-day festival that saw enthusiastic participation from all the other campuses. Over 6 months the campus teams built communities, on boarded influential stakeholders within students & faculty, created content that was both relevant & engaging, monitored their efforts daily, iterated and reiterated – living the highly dynamic life of a marketer in today’s social world. The winning team from IIM Shillong was mentored by their faculty Mr. Pradip H Sadaranjani and comprised off Piyush Aggrawal, Kamalpreet Singh Saluja, Ganesh Shanker. They are the Social Marketers of the Year! Congratulations to all the winners and a big round of applause for all teams that have participated in this challenge. Results will be posted to the GetSocial? site soon. What happens when you throw a challenge to the brightest minds from across India to use the social web for their campus? You get the Google ‘Get Social?’ Marketing Challenge - that was designed to give students a real-world flavor of how to build, nurture and leverage social communities to transform the way campuses interact internally & externally.